﻿ LastMinute Recovered from 50% Traffic Drop- Negative SEO or Unnatural Link Building? LastMinute Recovered from 50% Traffic Drop- Negative SEO or Unnatural Link Building? Update: LastMinute Recovered its rankings in 2 days. Read about the recovery! Although the winter is barely over, we are already thinking of pina coladas and ocean breeze. And what better way to daydream than looking up for summer holidays deals, cheap flights and convenient accommodation? After the Halifax Penalty a few weeks back, it seems another big brand might be affected by Google. Yesterday we noticed a mention in TheDrum about a big brand in the travel industry that was hit by Google. The travel and leisure industry is a very dynamic market, full of companies that leave you with a bunch of holiday pictures and empty banking accounts. And as the economic crisis has already left us with empty pockets, there is not much left for the travel agencies. Therefore, companies operating in this field might turn to less orthodox methods to position themselves among the first choices in their consumer’s mind. The reason we brought lastminute.com to your attention is because we have noticed a really big drop (46%) in organic search visibility this week in UK. Let’s see what it’s all about! Every time we’re trying to figure out what happened to a certain website, the first chart we look at is the one with its visibility drop. We have the natural tendency (and I also suspect a bit of penalty phobia here) to believe that when a major visibility drop occurs, it surely has something to do with Google’s Penguins. From the chart below, we can easily see that February wasn’t the best month for lasminute.com as their drop is, indeed, notable. (This is the visibility for the last 2 years). If we take a look at the December link velocity, we can easily see some “pharmaceutical activity” on the roll. One might say that maybe “the gifts month” inspired people to ask for unexpected requirements of their holidays. Hilarious or not, we think that the situation is severe and lastminute.com is dealing with quite a negative SEO attack. The chart shows links appearing like magic and then, disappearing like magic. As we take a look at the chart below, we observe that, starting at the end of January, a large number of links begin to be “lost” in the mists of the Internet. If by mid December they had almost 700.000 new links and only 1.500 lost, now the situation is quite paradoxical. We’re dealing with more lost links than new ones. The score is something like 165.000 to 112.000. If I’d ask you to think of keywords that an online travel agency might use, what would you answer? I have a hunch that you would tell me terms like “cheap flight,” “holiday deal,” “cheap accommodation,” etc. Oh, well…apparently, on lasminute.com it’s fashionable to use unrelated pharmacy keywords. We’re not saying that “Viagra” or “Cialis” cannot be related to a successful holiday, but we don’t think that these are the main keywords lasminute.com wants to be associated with. With 861 referring domains (only 6 of which are still live) with link anchor text containing “Viagra” and a big collection of hacked sites used as parasite hosting, we tend to think that a negative SEO attack might me going on. All the Viagra related links (except 6 referring domains) are lost when we crawled the backlinks for lastminute.com on the 28th of Feb 2014. For a better understanding of the issue that lasminute.com is dealing with, take a look at the image below. The snapshot is taken from a domains hosting website that has a huge number of hidden link parasite hosting. Impressive isn’t it? And not in the good way of the word. The next thing we think at when it comes to a link audit and a possible penalty, is the number of unnatural links. From our analysis and experience, usually, the penalized sites have an alarming number of unnatural links. As we take a look at how lastminute.com is standing, we see that the natural-unnatural link ratio is quite good. The site seems to have a good-looking profile, based on an organic link building strategy. If you were breathlessly expecting for some big, unnatural profile at the anchor text distribution, I’m afraid I have to let you down. The anchor text cloud for brand and commercial keywords looks quite normal. Nothing suspicious on this side, either. It’s true that 4% from the total of links are unnatural but overall, we cannot say that this could be the cause of a Google Penalty. We looked through the unnatural and suspect links and here are 3 samples that give us a glimpse of how their old link building strategy used to look like. In the snapshot below we can see a “widget” link a low authority site, with an anchor text that looks suspicious because of its commercial nature. Here we can easily see a suspect use of anchor text on some low authority site. In this second sample we can identify a paid advertorial with a juicy do-follow link. As I mentioned before, the site is not “unnatural link free” but could they be the cause of a Google Penalty? Is this enough in order for Google to penalize the site. Maybe Yes maybe No. I saw much worse situations with really big brands that are still ranking. Their link profile is quite balanced from a naturalness point of view. Google Algorithm Updates – its common knowledge that Google makes systematical and periodical changes to its algorithms, leading to ranking fluctuations. This could be valid but we have to take into consideration that lasminute.com has had fluctuations before, but none as dramatic as this one. Also, the drop was mainly caused by some specific keywords. Website changes – another thing that we can think about is the lasminute.com website. Maybe there were some massive changes in their site architecture which lead to such important changes in their traffic index. Powerful backlinks lost – it is also possible that lasminute.com lost a number of backlinks that were sustaining those specific keywords that dropped. As I was mentioning at the beginning of the article, it’s hard to tell what exactly happened with the lasminute.com website. For instance, in the picture below, we see indeed that the trend for the keywords position is descendant but the average individual drop position is not very high. This make us think that something in particular happened to those keywords or maybe Google Volatility interferes again. Let’s take a closer look at what really caused the massive droop. Is this drop so massive? 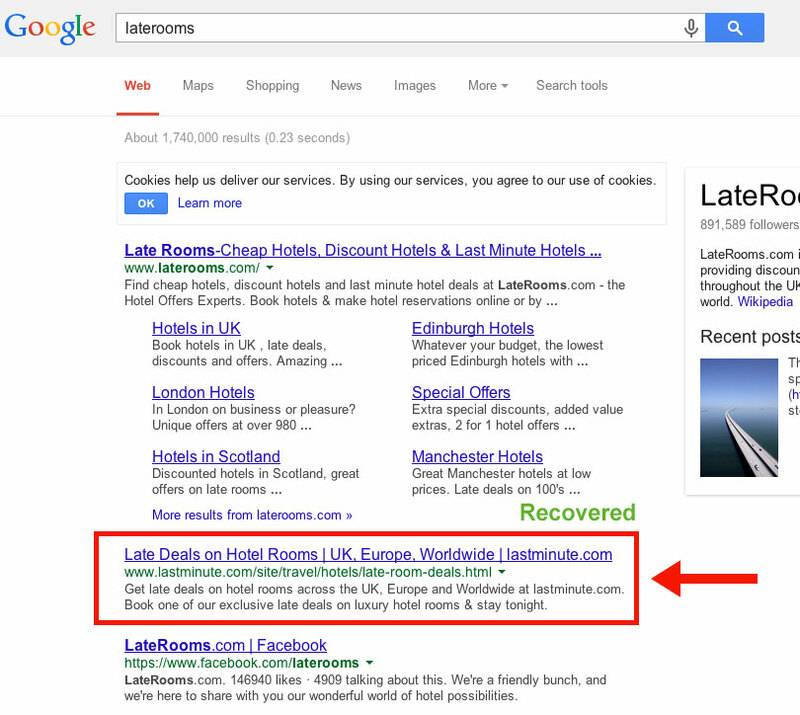 As we analyze the snapshot below, we see that some of lastminute.com’s important keywords lost a some ranking positions. Let’s take for example the keyword “laterooms”. This keyword alone messed up the lastminute.com traffic index by causing it to drop around 100 positions. The same thing has happened with the keyword “restaurants”. Thereby, only 2 high traffic keywords led to a 30.000 visibility points decrease. The drop in the visibility rank is, thus, legitimate. The confusion here appears because of how the SEO Visibility index is calculated. They lost traffic only on same high traffic keywords, but we do not see a huge drop in positions. The keywords moved from the first page to the second or third on an average. This does not indicate usually a penalty but more a flux or a “normal” day in the land of Google. After analyzing several assumptions, we cannot put the finger on the exact cause that led to the visibility rank dropping. We can say for sure that something indeed happened, and judging by their link anchor text and their link profile, we tend to believe that lasminute.com was not affected by negative SEO, nor Unnatural Links. They are simply affected by a slight change in the algorithm maybe combined with some loss of some power links that they had and maybe some internal linking problems on the site. Saturday morning, on the 1st of March 2014, the LastMinute site started to recover its rankings. All the dropped keywords in the image above are back to their initial rankings. This means that the conclusion of the 50% Traffic Drop was correct. 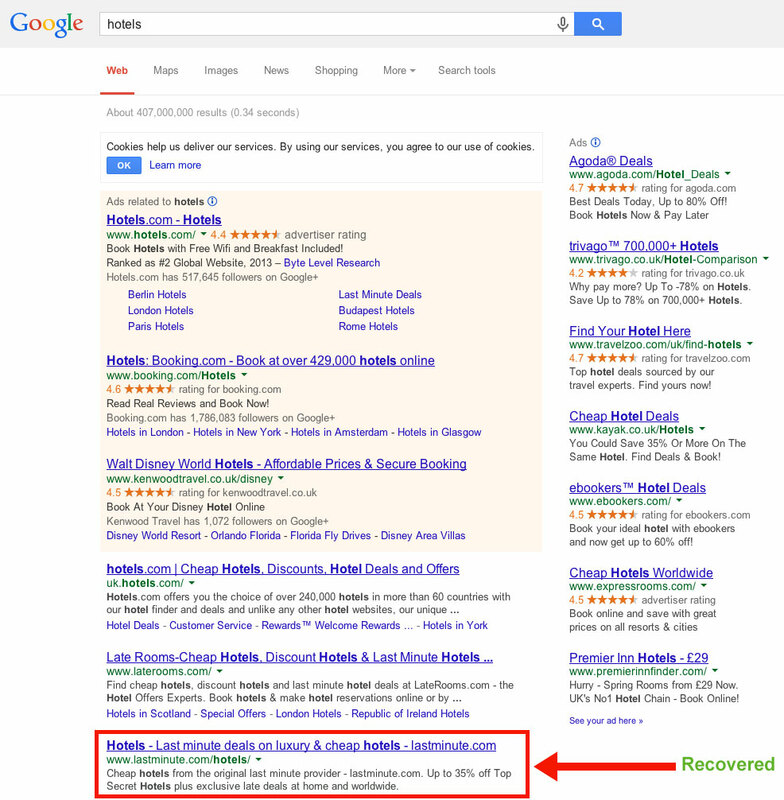 This was not a Google Penalty, but a Google Flux or a small side effect of some small on-page/off-page change. Here are some quick snapshots from the SERPs on some of the dropped keywords. Here is the “laterooms” keyword that was dropped from the top 100. Now it is back on the second position. You should always check all possible hypothesizes, by doing an in-depth analysis and looking at all the angles. Don’t get distracted by the obvious stuff that might lead you to the wrong conclusion! What is your opinion on the Lastminute.com drop? That is penalty for sure, why the hell companies like these use such link building companies to make links for them. on what do you base your “penalty” assumption exactly ? we are small company so we do our seo our-self with help of tools like cognitiveseo But still we are not too fool to make such mistake. One thing I would like to ask from experts that after looking at my site what you think how many links are good per month to avoid any wrong impression on google. you can reach to site by clicking my name I hope. Any help with be much appropriated. Otherwise I don’t want to be next last minute of hallifax. simply stay on the google guidelines side. you should be safe in 99% of the cases. Halifax tried to be grey and lastminute did it a long while ago as most of the sites did it when Google was not that accurate in its link profiling. Hi Razwan, Thanks for your reply. Can you please advise the link for a guide you have for small business seo or for link building. so, how many links per month i should focus on to be safe and get in top after few months. a feedback will be much appreciated. Look to hear from you. you should focus on building the brand and not the links directly. the links are the byproduct of the brand. do you think that the pharma keywords hurt lastminute? do you have any proof or explanation with more details on this. I do not think they were hurt by the negative seo attack as showed in the case study. The insights and the opinions shared in this blog are appreciable. Thanks for sharing. Hi, I am trying to find the SEO visibility chart…where is it in the tools please? Very interesting article. I’ve noticed sites disappear off page 1 altogether that have been very strong in the past (many ranking #1) for no particular/obvious reason. Then they reappear a day or so later, sometimes more. Just a theory, but perhaps Google could be “testing” you to see how you respond. Some panicked webmasters might go on a link building spree in response, for example. Awesome blog, described everything very clearly about how last minute recovery has been done when site is about to loose major part of its traffic and SEO ranking because of negative link buidling. I Started my blog last year in the month of July and soon after a few months I started getting awesome response, My traffic was increasing my Ad revenue was touching heights and then I thought It would be a right decision to move to self hosted wordpress. At that time I thought it is a common thing to happen, I would recover after a month but No luck, I migrated in April and it is now September and still the traffic is near about 50% of what I used to have in those early days. Any idea on why it might have happened and How can I recover from this thing? lot of things could happen. it is not that easy to diagnose this without looking at the exact case. I don’t think is a penalty, you don’t recover that quick if your site has been penalized. I think it was an attack. none I would say. just a flux. Pretty Nice For Seo beginners, After read this article I really excited about how they recover in 48 hours after penalty. i used disavow tool and it took 6 months from recovery. And the mean while i mail to their webmaster each week but still 50% recover from penguin. Can You me is there any option so that i can try for my website. Ram they did not have any penalty. please read the conclusion of the study. Congratulations for this deep analysis, We can learn some seo things that We must avoid, thank you for sharing this information. First nice to have a detailed overview of analysis, it really helped me to learn about analysis. However, I have bit confusion when you said they recovered in just 48 hours. I am not sure if they did when you wrote the case study. But now as on 17th Apr they are not on first page for the terms you have given “hotels” and “laterooms” in US results, while they rank only for “hotels” and not for “laterooms” in UK results. I feel nothing could be concluded as regards SEO and ranking is concerned. the analysis and all the visibility and drop results are for the UK SERPs. These are two different things. Thank you for helping me over email.. On my Negative SEO, i did not know how to set it up to find unatural links.. Meaning i see the directory listing with low authority in green.. They should be flagged red. But on another note when i used the link explorer i have found a large amount of bad links that ahref, majestic or webmaster tools did not detect.. Same situation i am facing now. Everything is ok .. Yes i did many changes in on-Page. migrate my website http to https last month. My Site Traffic down but i didn’t receive any message from google if it is penalty. But if i check my website in tools like semrush, majestic . they’re showing 0, 0 and no any new backlinks ..
Last month my site maybe got some penalty am still looking what should be the ratio for anchor text? Regarding the anchor text ratio,within the article you will find an example of a normal anchors ratio. Actually, I’m facing the problem of low traffic now last month the traffic on my website is very good but now is to low can you please help me. Pretty Nice For Seo beginners, After read this article I really excited about how they recover in 48 hours after penalty. i used disavow tool and it took 6 months from recovery. I faced Some issues while I activated the SSL. But my rankings dropped instead of increasing. I think it was an attack. you can’t recover quickly if site has been penalize!